It's almost August! I'm always amazed at how quickly the time goes! 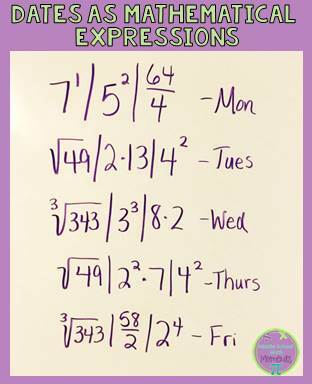 This is just a quick post to share what I'm planning with "math dates" this year. 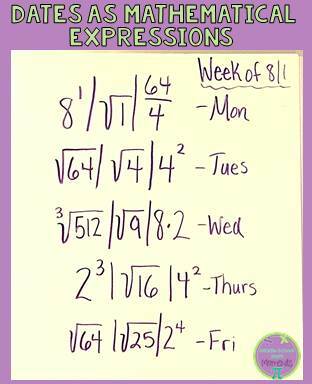 Last year, I got such a positive response when I posted ways to write the dates as mathematical expressions. So I decided to get a little more organized with it this year, and plan the week of dates on Sundays, instead of thinking of them one day at a time. Every Sunday, I'm going to post the week's dates on Instagram and Facebook, so if you'd like to use them, you might want to follow me one of those platforms (if you aren't already). I'll post the dates here sometimes as well, but not as regularly. I loved using expressions as the dates last year - it kept students fresh with their exponents/exponent rules, exposed them to roots (we don't really study these yet in 6th grade), and encouraged them to figure out their own expressions. 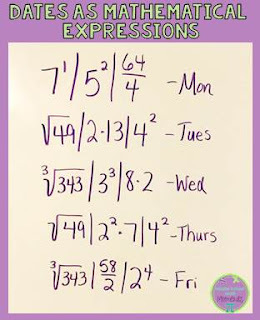 Do you already use something like this in your classroom?